BBC presenter Jake Humphrey has announced he is to leave the corporation to host BT Vision's Premier League coverage. BT will launch a new channel after acquiring the rights to £738m worth of Premier League football, starting from the 2013-14 season. The 33-year-old, best known for hosting the BBC's Formula 1 coverage, will anchor the new channel's live football coverage from next season which includes 38 live games a season over three years. 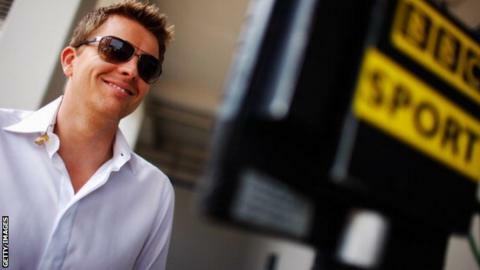 He will continue to present the BBC's F1 coverage for the remainder of the current season. Humphrey started his career on CBBC and went on to become the youngest host of Football Focus, Match of the Day and Final Score and was one of the main broadcasters during the London 2012 Olympics. "I'm incredibly excited to be joining the team at BT, not just because I get to fulfil a lifelong dream of presenting the Premier League but because of the fresh perspective that BT will bring to both sport and broadcasting in this country," said Humphrey. A BBC statement read: "We'd like to wish Jake all the best for the future, and thank him for his contribution to the BBC over the last 10 years."